The monetization tips are back. If you followed me last year, I used to post monthly tips. I decided to bring the monetization tips back in 2014 weekly. 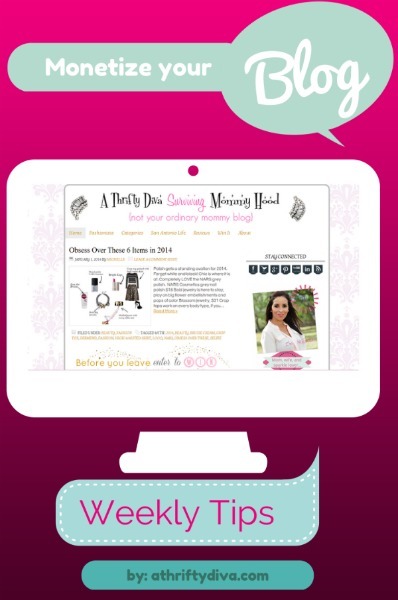 If you blog and are looking for ways to grow your brand be sure to check back every Thursday. Are you part of the Linqia community? Linqia is a campaign based community. I have done a handful of campaigns on Linqia like the Go Green, Tia & Tamara and Mom’sPure Wisdom. These are pay per click campaigns. As long as you get your readers clicking through, you will get paid. The better your click-through activity is, the more money Linqia will offer you for your next campaign. Linqia also pays within 7 days of your campaign ending. I have not waited more than 4 days for payment. Join Linqia today and start earning money for writing.